The final curtain is about to come down on one of the City’s of London’s longest running shows. Ever since Big Bang in 1986, when deregulation opened up access to securities markets, the attempts of British banks to compete with the leading Wall Street houses have created a compelling spectacle full of big bets, ruined reputations, and fortunes won and lost. But comments last week from John Mc­Farlane, Barclays’ chairman, suggest that the play is finally moving to a smaller theatre. “When you look at the dominant investment banks, they are North American” said Mr McFarlane. “They have the scale that we no longer have to be global so we are going to have to focus.” It was a devastating comment from the head of the one British institution in the investment banking big league. Is he right and if so what does that mean for Barclays and the City? What to do about investment banking is a question that has troubled Barclays ever since 1983, the year Timothy Bevan, a great-grandson of the first chairman, signed off on a proposal to buy and build an investment bank. It proved to be harder than it looked for Barclays and the other British groups trying to muscle in on Wall Street. The Americans had capital, experienced management and a hugely profitable home market. They powered into London, grabbed the biggest deals, hired many of the best bankers and squeezed margins. Globally aspiring UK investment banks were forced to give up.Barclays was the last one standing until it sold its equities and corporate finance business in 1998. But Barclays and investment banking were not quite done. Under the American Bob Diamond, it cleverly worked its way back into the business, culminating in the acquisition of Lehman’s US business in 2008. It secured and indeed retains a seat at Wall Street’s top table. Yet just as Barclays sat down, others got up to leave. Stringent regulations after the crisis forced banks to conserve capital and cut unprofitable businesses. Clients who had once preferred to buy products from full-service institutions came to accept that specialists have a role to play. The fashionable investment-banking model has become the slimmed down, return on assets-focused version exemplified by the likes of UBS rather than that of the monsters that once gobbled up market share and capital. Only a handful of global players remain. The “shrink-and-swim” strategy implied by Barclays last week is thus perfectly credible. It starts from a position of strength; pruning is easier than growing; and investment banking-light is a proposition shareholders, clients and staff find credible today. Yet Barclays’ decision to refocus has consequences for the City. It would leave the UK without a global competitor — just as it was between 1998, when the company last withdrew from full-service investment banking, and 2008 when it went back in. Last time it seemed superficially not to matter. London flourished as a global financial services capital. Employees, clients and regulators grew used to the idea that head office was in New York; and jubilant bankers derided the idea of national identity in the fast and fluid world of global finance. The banking crisis gave cause for second thoughts about this Panglossian idea. By adopting US-style investment banking, the City had thrown away its cherished traditions of prudence and patience, and left the UK unhealthily exposed to a business it did not understand. What happened in the next decade was that the authorities stood back and lost control. The presence of Barclays Capital in the middle of the global stage offered a brief period of knowledge and influence. Its absence will leave the UK more vulnerable. Is Turkey Creeping Toward Civil War? Turkish President Erdogan claims to be battling the terrorist Islamic State, but in reality he is mainly fighting against the Kurdish PKK militia. By doing so, he has shown that he is willing to derail the peace process in his country for the sake of clinging to power. Newal Bulut grew up in war, and now she fears it could return. She is a 27-year-old graphic designer from the predominantly Kurdish city of Diyarbakir in eastern Turkey. Sometimes she asks herself whether that night in June, when the pro-Kurdish party HDP won seats in the Turkish parliament thanks in part to Turkish voters, was only a beautiful, ephemeral dream? Bulut spent several nervous months with Selahattin Demirtas, the co-chairman of the HDP. She applauded at his speeches, and convinced friends and relatives to support the young party leader, who not only promised but also embodied change in Turkish politics. At school and later at university, Bulut saw how friends who had advocated for more rights for Kurds, were arrested as suspected terrorists. She hoped that the HDP's success in the June 7 election would help Turkey become a peaceful, pluralistic country. Just two months later, Bulut walks through downtown Diyarbakir, wearing black leggings, dark nail polish and piercings. She strolls past armored police cars as fighter jets roar overhead. Anti-government protesters erected barricades and set cars on fire the night before. The words "Kobane is everywhere" and "Freedom for Öcalan" are spray-painted on walls. "I was naïve," says Bulut. The same ritual repeats itself night after night: At around 9 p.m., fighter jets take off from the military base outside the city to conduct air strikes against positions held by the Kurdistan Workers' Party, or PKK, in northern Iraq, and its offshoots in Syria. Only a few of the air strikes target Islamic State (IS) positions. At the same time, young Kurds are setting downtown Diyarbakir on fire. Where roadblocks are erected, the police respond with water guns and tear gas. But the protesters are not easily deterred. They chant: "This is only the beginning." In Istanbul and other cities, violent clashes with police have erupted, resulting in injuries and death. The Kurdish Spring has turned into a hate-filled, violent summer. Many people in Diyarbakir believe that civil war is inevitable. The peace process between the government and the Kurds has come to an end. Statements made this week by both Turkish President Recep Tayyip Erdogan and PKK leaders have confirmed as much. PKK fighters and Turkish soldiers are being killed almost daily by fighting, air strikes and attacks. Last week, it seemed as if Erdogan would finally do what the West has long hoped he would, namely to take action against IS after years of tolerating the militant group. After the devastating suicide bombing at a Kurdish youth rally on July 20 that left 32 dead in the town of Suruc, across the border from the Syrian Kurd enclave of Kobane, US President Barack Obama spoke with his Turkish counterpart on the phone. Both sides agreed to join forces in the fight against IS, something the Turkish government had stubbornly resisted until then. The US Air Force is now permitted to use multiple Turkish military bases as well as the NATO air base at Incirlik to stage its air strikes against IS militants -- access it did not have before. This dramatically reduces the distances US jets have to fly. Instead of taking off from their bases in the Persian Gulf and refueling mid-air, the planes now only have to travel 150 kilometers (93 miles) from Incirlik before reaching IS-controlled territory. Last Friday morning, four days after the suicide bombing in Suruc -- which, incidentally, no one has claimed responsibility for yet -- the Turkish air force launched an attack on IS positions. "Three F-16 fighter jets took off at 3:12 a.m. from Diyarbakir Air Base and bombed three IS targets between 3:40 and 3:53 a.m.," the office of the prime minister announced several hours later. A Cynical Excuse to Wage War? But Erdogan's true intentions quickly became clear. He wanted to use the opportunity to fight what he and the other hardliners in his party felt was the greater evil: the PKK. This has created an absurd situation in which Turkey is now striking at both IS and its most effective and toughest opponents. Seen in this light, Turkey appears to be using the Suruc suicide bombing as nothing but a cynical excuse to wage war, not against IS, but against the terror organization's victims. The Turkish fighter jets take off day and night to attack the PKK headquarters in the hard-to-reach Qandil Mountains in northern Iraq, as well as their positions in Turkey. Turkish tanks have also fired on fighters of a PKK offshoot in Syria who were near IS positions. What has been happening in the past week in northern Iraq and Turkey in particular seems counterproductive. As more and more countries in the Middle East have descended into violence, the peace process between Turkey and the PKK that had materialized after years of tough negotiations was a rare glimmer of hope. Erdogan himself long seemed determined to end a civil war that had raged for two decades and left 40,000 dead, but in which neither side could claim victory. "We can no longer wait for a political solution," he said in a moving speech to the Turkish parliament in 2009. "The tears of the mothers of dead sons on both sides will not allow it." But as paradoxical as Erdogan's current military strategy seems, considering what he said in 2009, it doesn't come as a surprise. Erdogan has always treated politics as war. No other prominent Turkish politician is more ruthless than him. By attacking the PKK, he is fomenting the sort of turmoil that will likely pave the way for new elections in the fall. In June, after 13 years in power, Erdogan's Justice and Development Party, the AKP, lost its absolute majority in parliament and is now dependent on a coalition partner for the first time in its history. For Erdogan, the election result is a setback. He had hoped for a two-thirds majority, which he needs in order to amend the constitution to create a presidential system and cement his dominant position for years to come. But the Kurdish HDP thwarted his plan when it entered parliament. Prime Minister Ahmet Davutoglu had 45 days to form a coalition. The deadline is Aug. 23. Erdogan apparently wants people in Turkey to have the impression that only a one-party government dominated by the AKP can manage the chaos in the country. He wants the HDP to be labeled a party of terrorists, pushing it below the 10-percent hurdle required to secure seats in parliament in the next election. This is also supported by the fact that the Turkish judiciary in Diyarbakir on Thursday said that it is investigating Demirtas for allegedly "provoking and arming" protesters. The question is whether this strategy can be convincing. Observers assume that Erdogan could draw voters from the far-right extremist MHP party to his AKP with his nationalistic agenda. HDP voters' loyalties appear to be unshaken even despite the recent tumult. Opinion polls show that only six percent of them would vote for another party should new elections be called. The stalemate could last for months, but that's not enough of a reason for Erdogan to abandon his cynical game. It's entirely possible that the president is unaware of just how dangerous his game really is. After many years in power, he seems increasingly disconnected from reality. A military escalation could not simply be stopped with the push of a button come election day. At the starting point of the current escalation, the border to Syria, nothing seems to be happening these days. Along the eastern section of the border, the Turkish town of Karkamis faces the Syrian town of Jarabulus. On the Syrian side, a black-and-white Islamic State flag is visible, fluttering listlessly in the hot summer air. Directly adjacent, barely 100 meters (330 feet) away on the Turkish side, is the office of Erdogan's ruling AKP party. The border crossing is closed, but there are no tanks, no troops, not even a border patrol station -- nothing to indicate that Turkey's campaign against the jihadi terrorist army is about to begin. So far, the Turkish government has consistently denied supporting IS. But in the gray zone between active support and passively looking the other way, Erdogan's government has facilitated IS' rise to power. Since the summer of 2012, when large numbers of foreign jihad recruits began flooding into Syria from Turkey, Turkish authorities have allowed them to enter and leave through provincial airports in the south. IS recruitment was long tolerated within Turkey, and members of IS were even allowed to use border crossings. It was only later, and little by litte, that Ankara changed its stance. In return for providing support to the international coalition against IS, the Turkish government has long called for the establishment of a "protective zone" in northern Syria, and now the Americans have agreed. It will extend about 100 kilometers from the border town of Azaz north of Aleppo to Jarabulus, and about 50 kilometers into Syria -- in the areas that IS still controls. The plan to drive the jihadists out of the region, other than with increased air attacks, has remained vague, except that rebels supported by the Americans and the Turks are to advance into the region. But which rebels, and how will they accomplish this? According to the official goal of the anti-IS coalition, the protective zone is intended to help cut off IS' supply lines and smuggling routes. But the Turkish government apparently has a different goal in mind: to prevent the Kurds from capturing and controlling a cohesive region along its border. The People's Protection Units, or YPG, as the PKK offshoot in Syria is called, have captured large amounts of territory from IS in recent weeks -- to Ankara's horror and Washington's delight. In mid-June, the Kurds managed to capture the Syrian border town of Tal Abyad, and before long they were only 30 kilometers from the unofficial IS capital of Raqqa. In doing so, the YPG was able to create a corridor between two of the three previously isolated Kurdish "cantons" in northern Syria. If the militia, together with other rebels, could now drive IS away from the border entirely, all of the "cantons" would be connected. Erdogan was already threatening war after the capture of Tal Abyad. "Under no circumstances will we permit the establishment of a new state in northern Syria." He was referring to a Kurdish state. Media organizations aligned with the government reported that 18,000 Turkish troops were being mobilized to invade the region that now encompasses the "protective zone." On June 29, the Arab-language newspaper Al-Araby al-Jadeed, published in London, predicted that Erdogan and his prime minister would "push for a Turkish intervention, especially in the region of Jarabulus, to prevent Kurdish forces from advancing any farther -- under the pretense of fighting IS." Now, only one month later, at least part of this prediction has come true. Although Turkish ground troops are not involved yet, it cannot be ruled out that this will happen soon. If the Turkish army does in fact march into Syria, "we will consider this an invasion and defend ourselves," the leader of the political arm of the YPG, Salih Muslim, warned in a conversation with SPIEGEL. Otherwise, however, he is trying to deescalate the conflict. "We do not want conflict with Turkey. If Ankara wants IS to be driven out, we can do this together with other local groups, Arabs, Turkmen and Kurds. Instead, the AKP has slammed the door shut and is trying to weaken the Kurds, who are fighting IS." However, there is currently no indication that Turkey will deploy ground troops. Even at a secret meeting of several Syrian rebel commanders in Ankara early last week, there was only talk of more support, but not of an impending invasion. Apparently a direct confrontation with YPG was also not on the table. Still, skepticism prevailed among the participants, including a leader of the Islamist group Ahrar al-Sham. "The Turks have already promised us twice to create a protective zone in the north, but nothing ever came of it," says one of the rebel leaders. "If they help us against (Syrian President) Bashar Assad or IS, okay. Otherwise we will continue fighting on our own." While the European NATO partners, especially the German government, criticize the Turks for their attacks on the PKK, the Americans apparently view the situation differently. For them, it is more important that the Turks, after years of unsuccessful attempts to win them over, are finally willing to help in the fight against IS. "We look forward to intensifying cooperation with Turkey and all of our partners in the global fight against ISIL," tweeted Brett McGurk, US President Barack Obama's deputy special presidential envoy for the Global Coalition to Counter ISIL, while ignoring the fact that two of these partners are currently declaring war on each other. A possible escalation, McGurk hastened to add, would certainly not be the fault of the United States. "There is no connection between these air strikes against PKK and recent understandings to intensify US-Turkey cooperation against ISIL," he added. The US State Department declared that while PKK is a terrorist organization, improved cooperation with Turkey would now make it possible to offer the Syrian group YPG improved air support. In doing so, it created a separation between the two closely cooperating organizations, a distinction that apparently only exists in the minds of Washington politicians. It is a bitter irony of history that Erdogan, as president, is now waging war against the PKK, even though, as prime minister, he did more for the Kurds than any previous Turkish politician. In 2005, he was one of the first to publicly state that there was a "Kurdish problem" that needed to be resolved democratically. Before then, the Turkish state had long refused to even recognize the Kurds' existence. Erdogan granted the country's largest minority greater autonomy and invested billions of euros in the infrastructure in southeastern Turkey. He relaxed a ban on the use of the Kurdish language and permitted Kurdish radio and TV stations. In 2012, Turkish intelligence began peace negotiations with PKK leader Abdullah Öcalan, who has been imprisoned on Imrali Island in the Sea of Marmara since his arrest in 1999. But it was precisely because of this policy of détente, for which Erdogan was widely praised, that he lost something that had been extremely useful to the Turkish leader in his efforts to retain power: the external enemy, against which Turkish voters could be stirred up for decades, and also disciplined. A climate of détente took hold, and new political movements developed, such as the protest movement against the destruction of Gezi Park in Istanbul and the arrogance of those in power. Erdogan repeatedly tried to create new enemies with his tirades against foreign conspiracies. He conjured up conspiracies against Turkey by supporters of influential exiled cleric Fethullah Gülen, the "interest rate mafia" and the German airline Lufthansa. Erdogan "controls the hatred or the fear of the lower class," Turkish journalist Ece Temelkuran wrote in the magazine Zenith, describing the autocratic ruler's manipulation of popular resentments. But these new efforts to create a bogeyman were not overly successful. After all, how much outrage could an "interest rate mafia" generate compared to a guerilla organization? The PKK has also contributed to the escalation. Its fighters have reportedly committed a series of attacks in recent days. Last Sunday, PKK militants killed two officers in the town of Lice and injured four other soldiers in an attack on their military vehicle. In Diyarbakir, militants fired on a tearoom in Diyarbakir, killing a police officer and a civilian. Three soldiers were killed in an attack in Sirnak Province on Thursday. This is only the beginning, threatens Murat Bektas, saying that his organization will plan further attacks if the Turkish government does not stop its strikes. Bektas heads the YDG-H, in Diyarbakir, a youth organization aligned with the PKK. And it is angry young men like him who are promoting the escalation. Bektas has learned to build barricades and use weapons. "I am armed for this battle," he says. He is considered influential within the movement, because the PKK depends on the young, dedicated members of the YDG-H. Bektas is slim, dressed in jeans and a baggy shirt, sports a three-day beard and has a wrinkled forehead. He has been living in the underground for the last five years and, together with other activists, remains hidden in a concrete building on the outskirts of Diyarbakir. He does not reveal his real name. The noise of a busy street can be heard through a window, there is a portrait of Öcalan on the wall, and a Kurdish newspaper lies on the table in front of him. The headline on the front page reads: "The AKP Has the Blood of Our Children on its Hands." Many members and supporters of the PKK never believed in the peace process, says Bektas. Because Öcalan was pushing for peace, he explains, his supporters obeyed his orders to promote peace. But the Turkish military's advances against PKK now show that the government is uninterested in peace with the Kurds, Bektas adds, which is why the group is determined to renew the struggle. Many citizens in Diyarbakir and other cities in the region have already armed themselves with knives, pistols and machine guns, says Bektas. "We are prepared for the worst." Moderate forces have fallen behind within both the PKK and the Turkish government, as the agitators have taken over. HDP leader Demirtas has sought to deescalate the conflict in recent days, but his messages hardly make an impression on the radicalized youth anymore. "Even more blood will be shed," warns Mehmet Öcalan, the brother of the PKK leader, in a telephone conversation with SPIEGEL. "Abdullah is the only one who can stop the catastrophe at this point." But Öcalan is cut off from current events at the prison on Imrali Island. The government has not allowed anyone to visit him since April. Talks between the Turkish government and the PKK have repeatedly been on the brink of failure in recent years. Nevertheless, as recently as February Öcalan issued a statement calling upon his supporters to finally renounce violence. The rebel leader called it a "historic decision." Half a year later, his words no longer apply. As a symbol of how the US punches above its weight, nothing beats the pre-eminence of its currency. The US may account for just a fifth of global gross domestic product, but dollar assets make up three times as great a proportion of global reserves. Most commodity trading uses the greenback as the medium of account. This influence is telling. A working paper from the Bank of International Settlements found almost $8tn of dollar credit issued to non US borrowers. More recently the IMF pointed out how past episodes of dollar strength have coincided with a rash of emerging market crises. Now that the greenback is surging again — the dollar index is up 20 per cent since last autumn — the implications are moving into focus. First, some perspective is in order. Although the dollar index rose from 80 in October to 100 in March, such price action is run-of-the-mill when examined over a longer period. Between 1981 and 1985, the same index soared from 90 to 160, before a co-ordinated international effort pushed it all the way back within three years. Dissecting the dollar is something of an art; a bet on its strength can reflect confidence in the US, or darkening clouds elsewhere and a rush to safe assets. The same IMF paper has shown that rising US rates are beneficial when they reflect optimism about growth, but not if driven by tighter money. On many occasions dollar strength has coincided with fears about growth; last autumn, for example, a spell of global deflation may have helped propel the dollar on its recent run. Of late, attention has focused more closely upon how well the US is doing. Indeed, it is striking how US monetary policy pays little direct attention to the dollar’s globe-trotting role. Peruse Federal Reserve statements, or recent comments by its chair Janet Yellen, and you will struggle to find much reference to the world beyond US borders. Ms Yellen is focused on the data, but the data in question is all domestic: unemployment, inflation and GDP. The global economy only matters insofar as it might impact upon the US. This week GDP revisions strengthened the chance of a rise in the rate some time before Christmas. One might expect the Fed to worry more about the strength of its currency, particularly given evidence it has hit the profits of US foreign subsidiaries. But the US is a fundamentally closed economy where domestic demand conditions outweigh those from overseas. Instead, if anyone is worried about the effect of a strong dollar, it is the IMF, which recently warned of “significant and abrupt rebalancing of international portfolios” should the Fed raise rates. A further reason for the dollar’s strength is confirmation of a lack of credible alternatives. Those Cassandras fretting about how monetary ease damages the dollar’s reserve currency status fail to appreciate how this is built not on its strength but its depth. Dollar assets are pervasive and easily sold. China’s efforts to prop up its stock market — including trading suspensions and printing renminbi to chase a market level — shows how far it has to go. Nor can the euro mount a challenge when the ECB appears politically hampered from dispensing cash in a crisis. In the words of an influential monetary thinker, “never reason from a price change”. What matters is not a currency’s price, but the forces driving it. At present, the dollar is strong because the US is too. Notwithstanding the IMF’s concern, Ms Yellen’s disregard for conditions outside of the US is unlikely to budge. Nor should it. The next rise in US rates will be the most telegraphed in the Fed’s history. There will be no excuse for a tantrum. Federal Reserve officials have fuzzy views on how wage growth fits in with their objectives for the economy. They would like to see wages growing faster. It would give them confidence that the economy is closer to their dual goals of producing healthy job growth and modestly rising inflation. But the linkages between wages, jobs and inflation are unclear, and so they’re not banking on faster wage growth materializing. In classical models of the economy, as the unemployment rate falls, slack in the job market diminishes, producing upward pressure on wages. Because wages are such a large component of business costs, wage pressures in turn get passed on to consumers in the form of higher consumer prices. But a growing body of research suggests the economy hasn’t been working like this for decades. Other factors — including global pressures, in addition to household and business views about the stability of inflation — have large effects that potentially outweigh any impact from domestic wages on prices. A recent paper by Fed board economists Ekaterina Peneva and Jeremy Rudd finds little evidence that the ups and downs of wages had large effects on broader consumer price trends either before or after the 2007-2009 recession. “Wage developments are unlikely to be an important independent driver of (or an especially good guide to) future price developments,” they conclude. This all matters now because the current pattern of wage growth is confounding. Ms. Yellen said last month in semiannual testimony to Congress on the economy that wages showed tentative signs of picking up. Fed officials want to see this because it would imply the job market is getting back toward full health and producing pay gains for workers. The Labor Department’s employment cost index had risen 2.6% in the first quarter from a year earlier, it biggest increase since 2008. Then on Friday, the Labor Department reported that the index tumbled down to a 2.0% growth rate in the second quarter, in line with its disappointing pace for most of the post-recession period. An upturn in wage growth seemed to disappear with one single disappointing report. Other measures of wage growth, including Labor Department measures of the average hourly earnings of workers, also are creeping along at a little above 2% per year. This plays in complicated ways into the Fed’s thinking on interest rates. 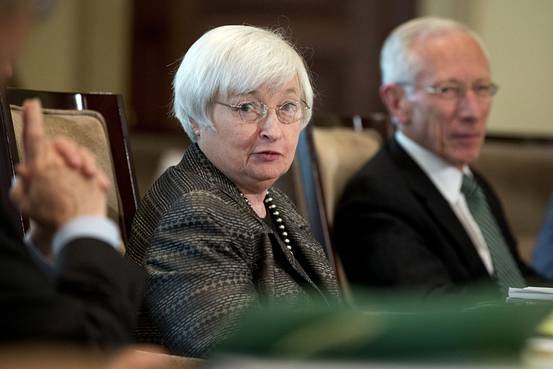 Fed officials expect to raise short-term interest rates this year. Will they proceed in an environment in which wage growth is not materializing? Given her stance, Friday’s employment cost report doesn’t look like a deal breaker for the Fed in its long-running debate about when to raise short-term interest rates. Wages appear to be stagnant but not clearly weakening, which is what she set out as her threshold for not acting. Still, it creates new doubts for officials and doesn’t help them build the confidence they’re hoping to build that the job market is nearing full employment and inflation rising toward 2%. The September policy meeting is thus shaping up to be a cliffhanger for the Fed and markets. Officials could decide they want to take a bit more time to makes sense of all of this. Still, other evidence could emerge before then that convinces them to look past the report and act on rates. This coming Friday’s jobs report, and its measures of average hourly earnings of workers, now becomes all the more important for the Fed in its continued search for evidence that the economy is truly on the mend.